I have to admit it, I am a big fan of clams. Piles and piles of them, popped open and dripping with sweet briny nectar. A clambake on a hot summer day is huge fun, a big bowl of steamers on a cold winter night, delicious. 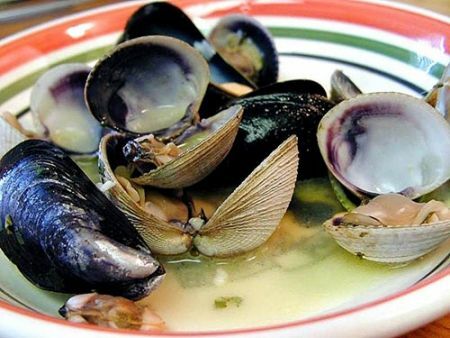 Hey I’m not the only one who loves clams, you might be interested to know that the clam has been one of man’s most popular and dependable food sources since prehistoric times. Many ancient cultures have survived on this simple, nutritious, primordial food. Clams are mollusks, a primitive creature with two shells, one on each side, connected by a single hinge. This shell protects its soft tender insides that are so vulnerable. By crawling into its “shell”ter the clam has protected itself for eons. Their brilliant simple home is hard as a rock, as it’s made of the earth metal calcium. Those shells are like a pair of metal doors that lock tight and provide great protection as it burrows down into the sea floor to keep out of harm’s way. Clams are survivors and can help you survive very well, too, by providing excellent nutrition protection for your body. Of course clams are a fantastic source of protein, but did you know that they contain a higher amount of protein than most other seafoods? Ounce for ounce clams have even more protein, vitamins and minerals than chicken. Its biggest nutritional asset is its super high iron content. I don’t know why liver and prunes get all the credit, clams have them beat by a long shot. Having enough iron in our diet helps us feel energized and keeps us from feeling rundown. The great vitamin C content will give your immune system a boost too. What is really great is that when you eat vitamin C and iron in the same food, you get a big increase in your iron absorption. What a bonus. The best part is that all this great nutrition is being securely protected for you in that little container called the clam. So come on down to Salty’s, this October, we’ll open the doors and serve them up for you. I’m a fan.